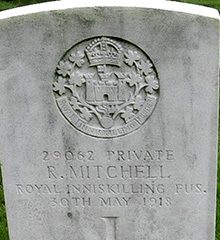 Robert Mitchell was born in Coagh. Before the war Robert was employed by Duff Brothers in Coagh. 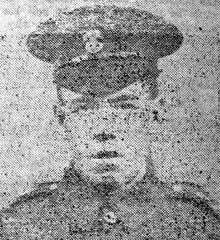 News of his death was first conveyed to Robert’s mother by his cousin, Sergeant Joseph Mitchell, who was also his Platoon sergeant, and who stated in a letter that Robert was killed instantly by a shell in a rest camp where they were just settling down to a period of rest after getting out of the trenches.